MV Lisas Way - Fulfilling our cruising dreams! LISAS WAY is a 2001 Bayliner model 4788. She was built in Arlington Washington USA by the motor yacht division of Bayliner boats, who at the time of her construction built of boats from 16 to 57 feet in length. For those who are now thinking, Oh, a Bayliner... Think again. The Bayliner motoryachts are a whole different boat than the 16' runabouts bearing the same brand name. Much in the same way that Chevrolet builds automobiles ranging from the inexpensive to the luxurious, Bayliner built boats of all shapes, sizes and price points. The MV LISAS WAY has a hull length of 47 feet, and measures 53 feet overall. she is 15 feet wide and weighs somewhere in the 40,000 pound range as equipped, ready to cruise. She is a classic raised pilothouse design consisting of from top down, a flying bridge and boat deck, a large pilothouse, a main living level, and a lower cabin level. One of the best things about the 4788 is the interior. This is where you live on the boat, so space and comfort are everything. 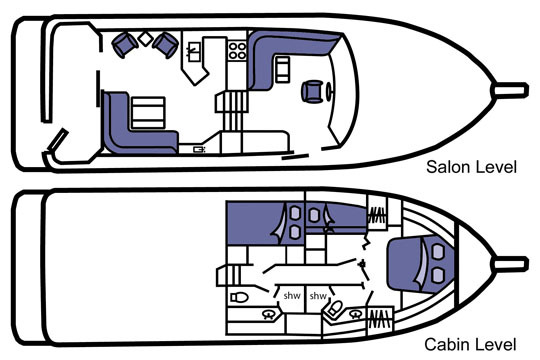 The salon level starts at the rear of the boat with a large covered cockpit. This is approx 6' deep and the full width of the boat. Large enough for captains chairs, and the BBQ without feeling crowded. The Main salon is just forward. This is full width of the boat so the side decks are very limited, but again comfort is all about living space. In the salon there is a large settee, approx the same size and shape as a home sectional couch, a large table, and room for a couple of recliners. There is even a wet bar and ice maker. The U shaped galley is just forward complete with a three burner stove, oven, large refrigerator, and trash smasher. Up three steps is the pilothouse, The main helm is here, offering a 180 degree view, a large captains chair, and a settee with table for guests. There are sliding doors that open from the pilothouse to the side and fore decks for docking and anchoring. From the salon deck its two steps down to the cabin deck. There is a straight companionway forward allowing access to the cabins and heads. There is a guest cabin on the port side featuring a full sized bed, closet, nightstand, and drawers for storage. To the starboard is the guest head, which has a large shower, sink and head facilities. Forward to the port is another guest cabin offering bunk beds, closets and more drawers for storage. At the forward end of the companionway is the full width owners cabin. This offers a queen sized bed, closets and drawers for storage along with a private head, complete with a combination bath tub/shower unit. The exterior of Lisas Way starts at the flying bridge. Access is either from within the pilothouse, or through a hatch above the cockpit. The flying bridge offers a full helm station, plus two large settees with seating for 8 or more. The boat deck is used for storing the tender, which is a Zodiac center console RIB with a 30 horsepower Honda engine. Launch and retrieving of the tender is via the ships crane and can be accomplished by one person in less than 5 minutes. The foredeck is accessed via the pilothouse doors and offers a settee for fair weather relaxation, along with controls for the anchor windlass. The Bayliner 4788 is a Semi displacement hull with soft chines. She is constructed of two layers of solid fiberglass separated by a foam core. Core samples show that the outer layer of fiberglass is a little over an inch thick, the foam core is approx 1/2 inch and the inner fiberglass layer is approx 1/2" thick. This hull building technique results in a hull that is strong, and provides insulation. Unlike some other well documented manufacturers there has never been a hull failure, or hull separation in a 4788 hull, with approx a thousand units in service. Lisas Ways engines are six cylinder Cummins units rated at 330 horsepower each. In 2011 we re-powered Lisas way with Cummins factory reman engines, replacing original Cummins engines which were nearing the end of their useful life. We could have gotten by with a major servicing of the old engines, but we wanted new trouble free engines to meet our cruising goals. Lisas Way cruises very comfortably at a RPM setting of 1300 RPM, making approx 8.3 knots and getting a little less than 2.0 NMPG. Increasing the RPM to 1500 brings the speed up to about 9.0 knots and reduces the economy to 1.5NMPG. If we want to fast cruise, for example to reach a destination by nightfall, she can cruise at 2400 RPM, making 14 knots and reducing the fuel economy to approx 0.75NMPG. Fuel capacity is 440 gallons, divided between her two tanks. At a slow cruise she has a useful safe range of over 600NM. At a fast cruise she can safely travel well over 250 NM. We prefer to cruise slowly most of the time, but one of the best advantages of larger engines is the ability to make a long passage during daylight hours. Lisas way is equipped with a Furuno Navnet VX2 navigation system with a 4KW open array radar. The entire navigation system is redundant, with no single point of failure. At the present time she has three 10" displays with plans to add another display to the system. Lisas Way is equipped with the latest in networking technology. When near AT&T cellular facilities 4G or LTE speed data connectivity is supplied. These typically provide between 3 and 15MBPS data speeds. When out of range of the cellular system, the network automatically utilizes a KVH V3 Minivsat satellite system which provides 2MBPS data speeds. Both of these systems provide dedicated IP addressing for remote access to the vessels security and monitoring systems. For voice communications, when within AT&T cellular range, Lisas Way is equipped with a Cisco VOIP telephone that acts as a normal extension off of the owners business PBX system. Out of cellular range, the KVH satellite system provides telephone service anywhere in the world. Dc power is supplied through a 12 volt house bank with a capacity of 830 amp hours. Charging while on shore power or generator power is from a Xanatrex 150 amp inverter/charger. There is also a Charles Industries 40 amp backup battery charger should the main unit ever fail. 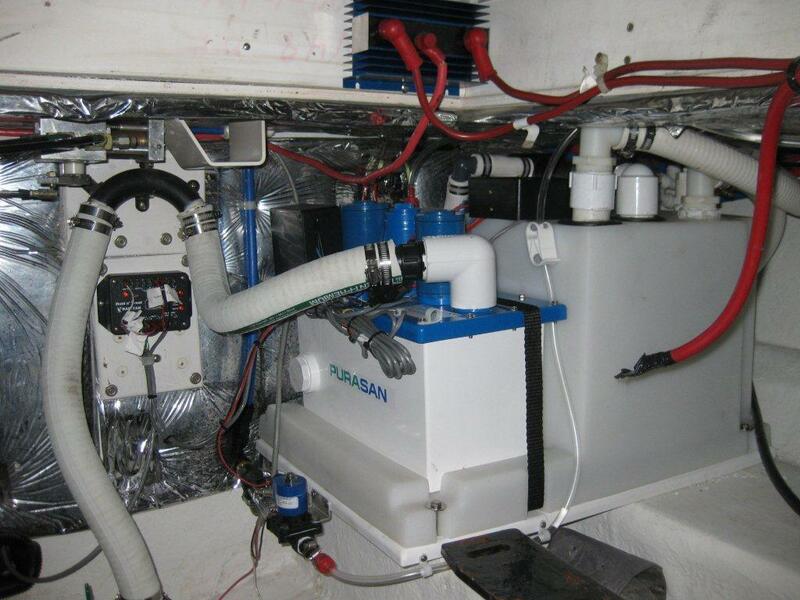 Charging underway is through a 150 amp Balmar alternator and smart charger on the starboard engine. There is also provision to charge using the Cummins 55 amp charger on the port engine, should the main charger fail. Engine starting is accomplished through dedicated 8D batteries for each engine. Ac power underway is supplied through the Xantrex 3KW inverter/charger. Most loads run through this inverter, with a manual bypass switch to protect against inverter failure. For power generation, Lisas Way has a Northern Lights 9KW generator. This generator has ample capacity to run all of the vessels loads. Shore power connection is via three separate 30 amp, 120 volt shore power feeds. We have the capacity to combine or separate these feeds based on shore power capability, and we can adapt to 120V 30 amp, 50 amp, or 120/240V 50 amp shore power sources. Lisas Way holds 200 gallons of potable water in two tanks. She is also equipped with a watermaker capable of 40 gallons per hour. This eliminates the need and the risk of taking on water from shore facilities. Hot tater is provided through a 20 gallon water heater. This water heater is powered by both 120 volts, and by a heat exchanger supplied by the starboard engine. Lisas Way is also equipped with a splendee clothes washing machine, eliminating trips to a laundry mat. There are two fresh water Vaccuflush heads onboard that are routed to a Raritan Hold N Treat waste processing system meeting both type 1 and type 2 USCG standards. When in a EPA no discharge zone, waste is stored in a small, 15 gallon holding tank, which holds approx 2 days of waste. When not in a EPA no discharge zone, waste is automatically processed, sanitized, and safely discharged overboard. Please note that the photo to the right was taken during installation, actually while the engines were removed for the repower, explaining the unconnected cables.